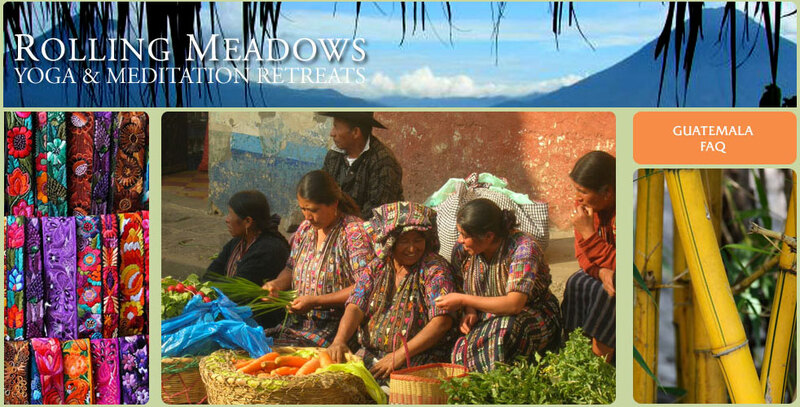 The following are some of the frequently asked questions about the yoga retreat in Guatemala. How should we travel there? Flights are into Guatemala City. Some people will likely be taking a short excursion in Guatemala on one side of the retreat or the other. If you are not doing that, we suggest booking a flight for the Friday February 10th and a return flight for Sunday Feb 19th. If your flight is early enough on Saturday morning you may go directly to Panajachel by shuttle or taxi. For ease of travel, we suggest most people travel on Friday, February 10th. You can take taxi or shuttle directly to Antigua which is and easy ride of 30 -40 minutes. There are many reasonable places to stay there – an attractive old Spanish Colonial city. In 2011 our shuttle from the airport to Antigua was $12. Rooms in Antigua range anywhere from $10 to $150 – with many around $30. Many of the hotels will arrange a shuttle to pick you up at the airport and take you to Antigua. The following are some links to site with hotels in Antigua, many of which are converted Spanish Colonial homes with a center courtyard. The following links offer information about accomodations: Two sites with information and links to hotels are here and here. Also see hotels. We will meet as a group at 12:30 pm Saturday February 11th at the Central Park in Antigua outside of Café Condesa for a shuttle as a group to Lake Atitlan. The shuttle from Antigua to the Lake is about $12 and takes about 2 ½ hours. Some people will prefer to make their own plans to travel to Villa Sumaya. You may contact Villa Sumaya to arrange a shuttle if you are not coming on the group shuttle on Saturday. The boat ride to Villa Sumaya is about 15 minutes and costs about $1.25. The phone for Villa Sumaya is 502 (country code) 4026 1390 or 4026 1455. The retreat coordinator is Lizzy and English is spoken. Xocomil is a good shuttle service – 502 7762 2005 (cell) and 502 5710 3903. Yes. Many people attend the retreats alone and if you do not choose a private room you will share one of the spacious rooms with another participant. What is the climate like in February? Villa Sumaya has a total of only 14 rooms. Each beautifully appointed room has a shower with hot and cold running water with a veranda and view of the lake. There are a limited number of private rooms. For the doubles, you may choose your roommate or we will assign you one. Are there any additional taxes we need to pay? No. All taxes are included in the price. However tips for the Villa Sumaya staff are appreciated. Is massage and bodywork available? Watsu is a gentle form of body therapy performed in warm water. It combines elements of massage, joint mobilization, shiatsu, muscle stretching and dance. See the following link for further information here. Villa Sumaya as some of the best vegetarian food we have ever tasted. Last year each meal seemed to surpass the ones before it. The menu is a blend of local Mayan and international meals from the vegetables, legumes, grains and fruit from the rich agriculture lands of Guatemala. Perhaps most remarkable were the giant plates of avocados. Fish and chicken are available for an additional cost. Please let us know if you have any food allergies. Are the retreats suitable for beginners? We expect about 20 participants. Surya has studied with many teachers in a variety of styles over the years – including Iyengar and the Viniyoga of Desikachar. The teaching is a synthesis of all that he has studied for 2o years and what has evolved during years of practice. See this page. In these modifications of classical poses, the muscles remain quiet; the shape and alignment of the pose is determined by props. Restorative yoga helps to trigger the Parasympathetic Nervous System, also known as the PNS. The PNS is responsible for balancing the body and bringing its response system back into equilibrium. Stimulating the PNS helps to lower heart rate, blood pressure; it helps to healthily stimulate the immune system and keep the endocrine system operating healthily. The practice of aligning with our true nature beyond the habitual patterns of conditioning. 7:30 Morning meditation ; 8:15 Breakfast ; 10:00 – 12:00 Asana class; 12:45 Lunch; 4:00 – 5:45 Restorative poses, yin yoga, pranayama and self-inquiry; 6:00 Dinner; 7:30 Meditation. There is plenty of time to walk to the nearby pueblo of Santa Cruz, take a boat to one of the villages on the lake, have a massage, take a hot tub or rest at one of the gardens and patios on the peaceful grounds of Villa Sumaya. I have heard of “yoga vacations” but this is called a “yoga retreat.” What is the difference? In order to support an environment of inward reflection, there will be silence after the evening meditation until after breakfast the following morning with additional periods of silence threaded throughout the retreat. Of course anyone may choose to have as much “alone time” as they would like to extend the periods of silence. Most people today have busy lives and spend very little time in silence. Silence is restful, being the mirror of our natural state. Silent community creates a supportive environment in which to deepen understanding, awareness, openness and compassion. This greatly enhances the benefits of a yoga retreat. Passport, toiletries, flashlight, sunscreen, a watch or time piece, layered clothing to accommodate the range of cool mornings and nights. Villa Sumaya has yoga mats. You may want to bring your own sitting cushion or some blankets to fold and use as a sitting cushion. Villa Sumaya has to charge 8% if you use a credit card to pay for bodywork session, etc. Personal checks or cash are accepted. There are ATM machines in Antigua and Panajachel and this is a useful way to obtain local currency.